Admire what Denpasar has to offer during a sightseeing tour of Bali’s capital city. Your knowledgeable local guide will show you top attractions, such as Puputan Square and Pasar Badung—Bali’s largest food market. You’ll view Indonesian art collections at the Bali Museum, and learn about traditional Balinese woodcarving and architecture at the Bali Art Center. Hotel pickup and drop-off are included in your half-day tour. Your local guide will pick you up at your hotel in Denpasar. Begin your half-day sightseeing tour at Puputan Square, an attractive open square located in the city center. 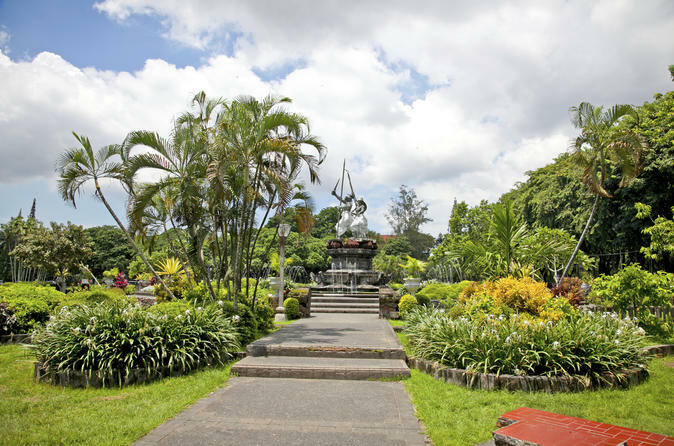 This classic urban park draws many locals and is a great place to learn about Bali’s colonial history. You’ll find a monument depicting a heroic Balinese family in the square, which commemorates the suicidal battle of the rajas of Badung against the invading Dutch militia in 1906. Next, head to the Bali Museum, located near the former royal palace of Denpasar. Spend 30-40 minutes exploring its collection that ranges from prehistoric finds to early 20th-century art. Four main buildings inside the museum showcases Indonesia’s rich history and cultural heritage. View displays of theatrical masks, musical instruments, sculptures, paintings and textiles. You’ll see scale models depicting ritualistic Balinese tooth filling, marriage and cremation ceremonies, which your guide will explain. A visit to Denpasar isn’t complete without experiencing the colorful pasar (Indonesian for ‘market’), where locals sell their products and haggle over prices. Pasar Badung is Bali’s largest food market and features fruits, spices and other edible goods sourced from the entire island. After an opportunity to browse and bargain, spend approximately 1.5 hours at one of the new supermarkets—the equivalent of a department store—where food is available for purchase (own expense). Your last stop is the Bali Art Center, a traditional Balinese building with a permanent exhibition of modern paintings and woodcarvings. Also known as Taman Budaya (Bali Culture Park), the vast complex also demonstrates traditional Balinese architecture. Your half-day tour ends with drop-off at your hotel.